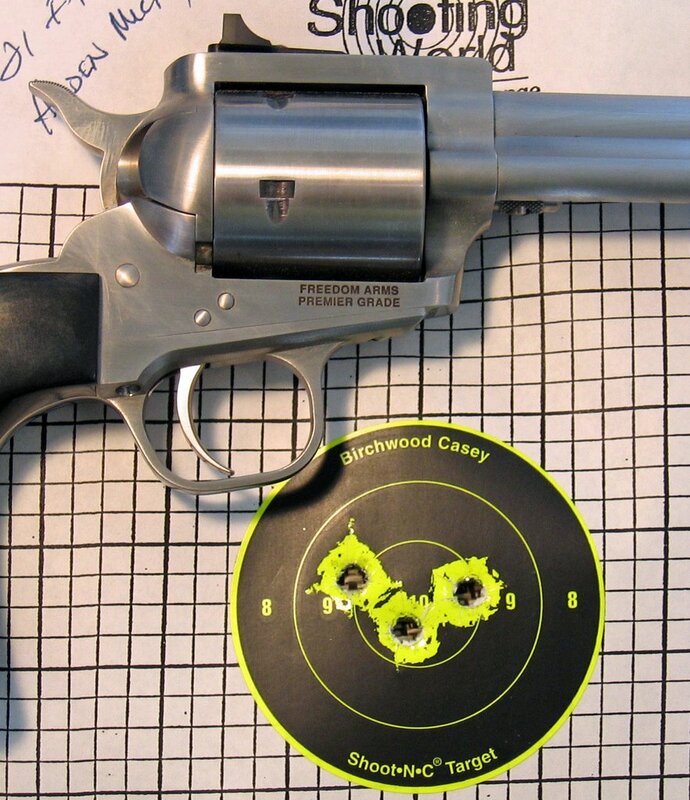 In this week’s Range Report we look at three big bore revolvers. All three are capable of handling just about anything that you might run into here in Idaho; Elk, Moose, Lions, Rotarians, Free Masons, and the occasional Shriner. The three blasters we shot today were (from top to bottom) The Taurus Tracker in .41 Magnum, The Smith & Wesson Model 325 PD with a 2.5 inch barrel in .45 ACP, and the Freedom Arms Premier Grade .44 Special with a 4.25 inch barrel. Why all the revolvers? 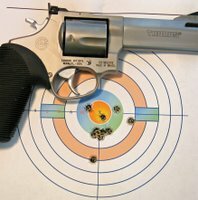 First of all it seems in today’s day and age with high capacity polymer pistols being all the rage it is important to remember how accurate revolvers can be right out of the box. Revolvers do not need any break-in period, there are no safeties to hassle with and they can be fired double action for fast defensive work or single action for slow precision shooting (in the case of the Freedom Arms revolver, single action only), they don’t eject brass all over the place and, with practice, can be loaded very quickly. 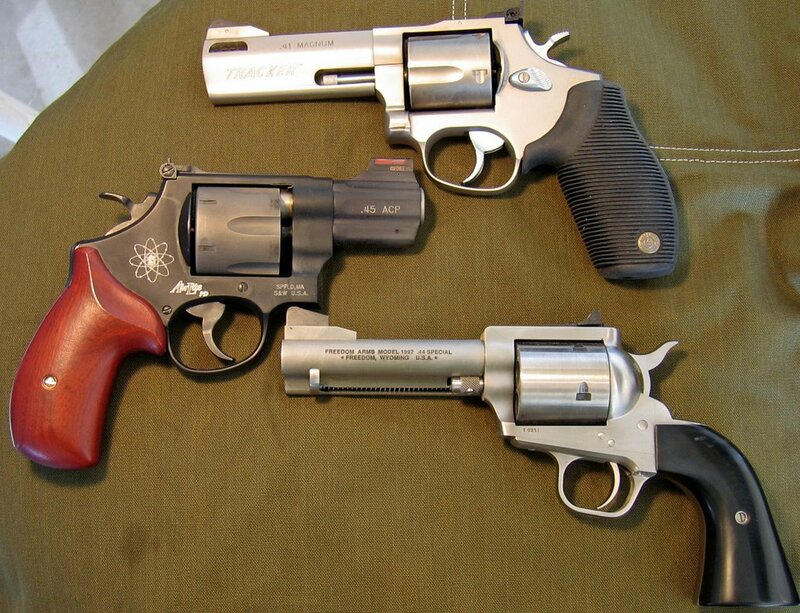 Freedom Arms revolvers are obvious copies of the various Colt single-action revolvers of the cowboy era. This model comes with a 4.25 inch barrel, a capacity of 5 rounds of .44 SPL, adjustable sights, ebony micarta grips and the most beautiful stainless steel finish you are likely to see on any handgun. Freedom Arms revolvers are handmade and the artisans in Freedom, Wyoming make every part of this revolver right down to the screws. Freedom Arms revolvers are also quite difficult to come by however, Sam, of Sam’s Guns in Pocatello, Idaho, always has a pretty fair line-up of Freedom Arms stock on hand. It may be difficult to determine which one I will want next, but it was not a problem to choose my first one. I had been coveting this revolver for the past 3 gun shows. The weight, balance, and action are all perfect and the adjustable sights are easy to regulate. 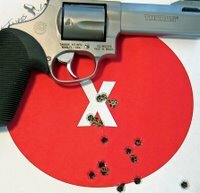 This revolver is accurate and an overall pleasure to shoot. Targets 1, and 2 are 5-shot groups from 21 feet. Target 3 is three rounds from 21 feet and, for those who are Disney fanatics, find the hidden Mickey in this picture. Target 5 is an attempt to shoot the “X” out of the target at 21 feet (the only problem was that the bullets kept going through the same hole). This is another revolver that is a little difficult to come by, but again Sam in Pocatello is very resourceful, and this gun had several surprises in store for me. The 325 PD is a scandium frame, lightweight revolver. It has adjustable sights, the front being a hi-viz bright orange fiber optic sight. 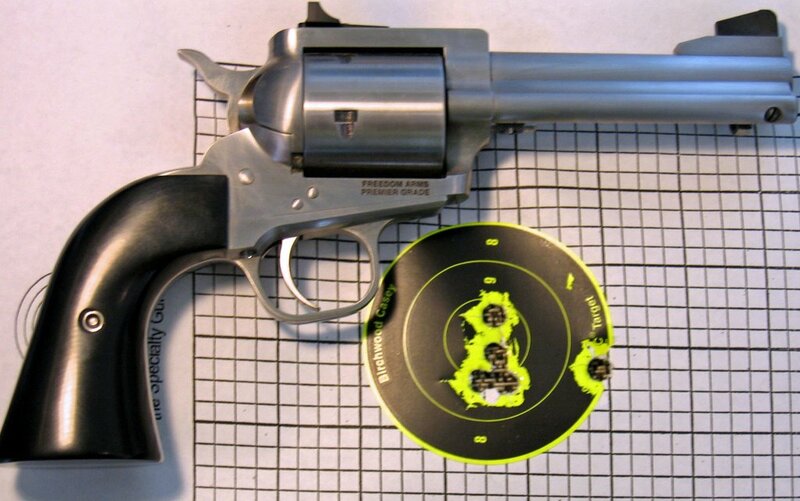 Here’s the first surprise, a revolver this small and this lightweight in .45 ACP has to have horrific recoil, right? Wrong, this little blaster was actually fairly easy to handle. 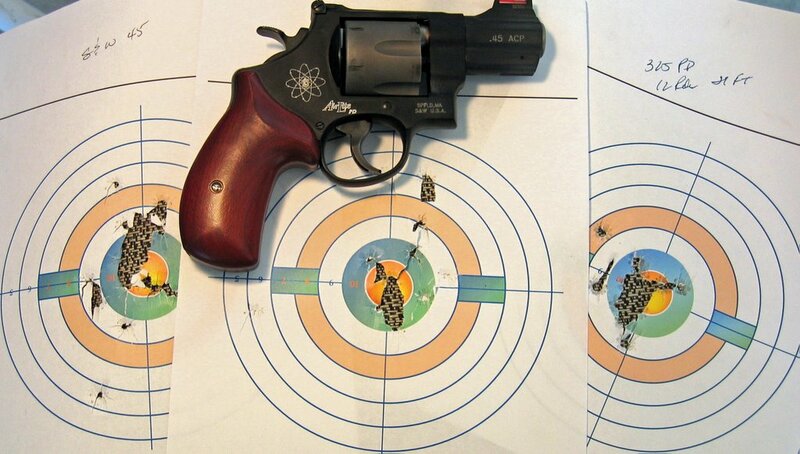 Second surprise, a revolver this small and lightweight in .45 ACP cannot be very accurate, right? Wrong! Targets 1, 2, and 3 were 12 rounds each fired at 21 feet. 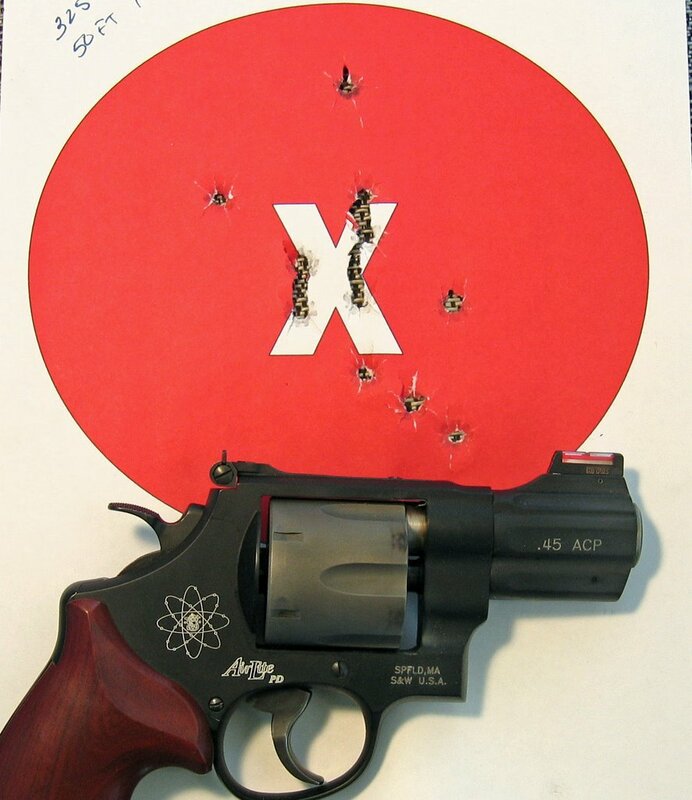 Target 4 is 12 rounds at 50 feet. 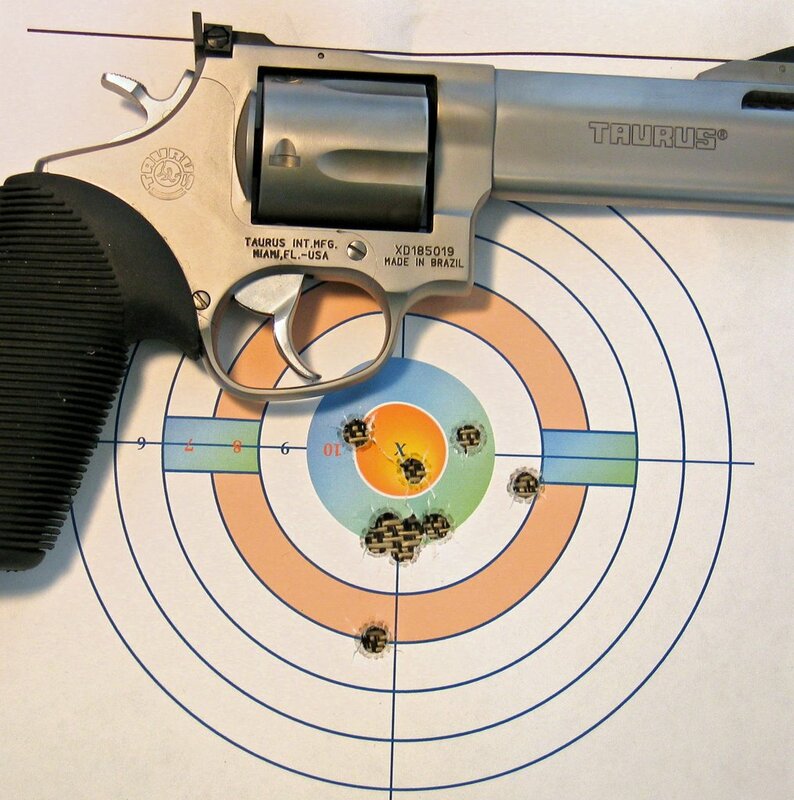 This revolver has the practical accuracy to meet all of your defensive needs. Third surprise, revolvers don’t jam, do they? Wrong! On my second cylinder full of Independence .45 ammo, the cylinder locked-up after firing the second round. The culprit was ammunition where the bullet had not been properly crimped into the brass. 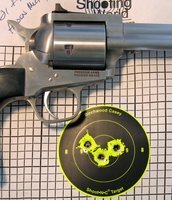 When this little revolver takes the shock of having .45 caliber explosions going off the bullets began coming unseated from the brass, causing them to stick out of the cylinder and causing the upcoming round to bang into the forcing cone. This happened to six rounds of the Independence ammo out of the first 18 cartridges causing me to discard the rest of the box. This then occurred with one CCI Blazer round out of a box of 50. I am happy to report that it did not happen at all with Mag-Tech and Winchester white box. 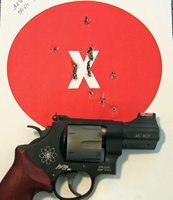 I have used the Independence ammo quite a bit in my semi-automatic pistols and it would appear that the magazine holds the round tightly in place and do not allow for the bullet to become unseated. On the left is a properly seated and crimped Mag-Tech round, followed by 3 rounds of the unseated Independence ammo and one round of the CCI Blazer. You can easily see how the bullets have worked themselves out of the casing and you can also see the crimp line on the three Independence rounds. The moral of this story is easy. Always buy well-made ammo. Quality does not have to be sacrificed when looking for the lowest price. The Tracker is a stainless steel revolver with a 4 inch ported barrel, adjustable sights, 5 shot capacity, and probably the best factory grips ever put on a handgun. The front sight has a red ramp and the rear sight is outlined in white. 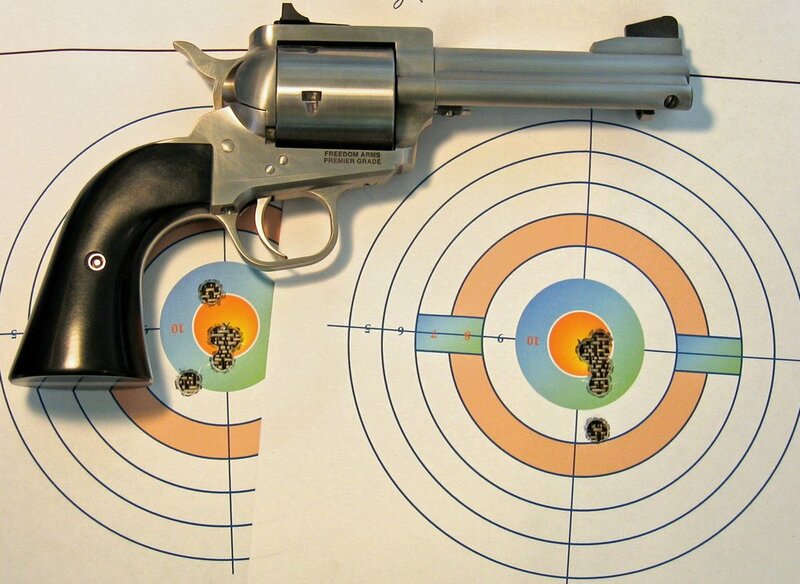 The .41 Magnum is a potent cartridge, but not unmanageable. 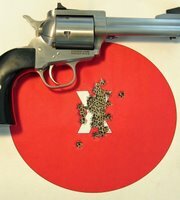 The first target is 10 round fired at 21 feet and the second target is 15 rounds fired at 50 feet.